Time For Heroes... After about a two hour wait The Libertines finally graced the stage of the Coventry Empire and one way or another it was going to be a night that everyone inside the 700 cap venue will never forget. I was perhaps slightly sceptical at first when they opened up with 'Barbarians', but that quickly changed. Messy, tenuously sloppy, full of energy and not giving a …. exactly what we all love about them, by the time 'Heart Of The Matter' kicked in, the venue was electrified. 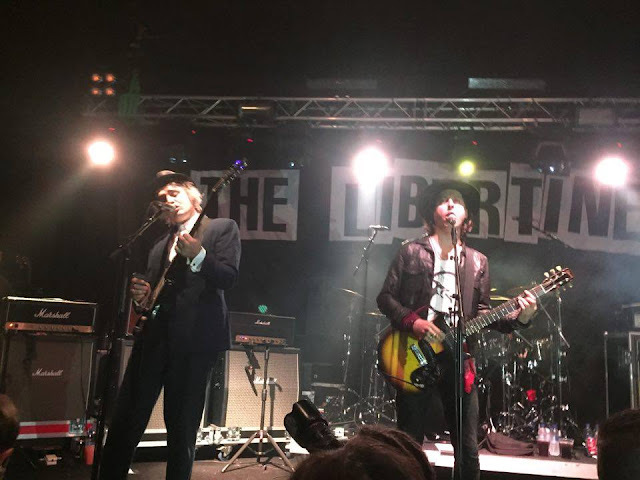 Five songs in the opening chords of a true Libertines classic ring out and truthful to the lyrics 'They scream and they shout for … for the boys in the band', it was a piece of magic which could only be followed by a several big cheers at the front of the crowd chanting 'Pete, Pete, ooo Pete, we love you'. What was about to follow was beyond special, after several people flying over my head (as expected in was a Libertines gig after all) the boys decided to mellow things out a bit. A true gem and certainly a personal favourite from the new record 'Milkman's Horse' reminded everyone why they fell in love with this band with lyrics that cut straight to the heart and touch your soul. It was classic after classic after that with 'What Katie Did', 'You're My Waterloo' and 'The Man Who Would Be Kind' making you not wanting to take your eyes of the stage for even a second. The lead single for the new record 'Gunga Din' brought the energy levels back right to roof and had everyone bouncing around. 'I Get Along' and things started to get messy at the front, after several punches to the head I had to retreat to the back for the rest of the show, but not before 'Can't Stand Me Now', despite all that probably the best gig anyone can ask for! 'Belly Of The Beast' another fantastic track from the new record, set the way for more classics such as 'Death On The Stairs' and 'Vertigo' reminiscing of the good old days. For all the sceptics out there The Libertines were better than ever before and 100% real, it was if though there was a time machine and we were all cueing up 10 years ago in front of Dublin Castle in Camden. Pete and Carl look at each other for a second as if to say 'This is absolutely brilliant' and then Pete picks up an acoustic guitar, we all knew what was about to come and 'Music When The Lights Go Out' starts. 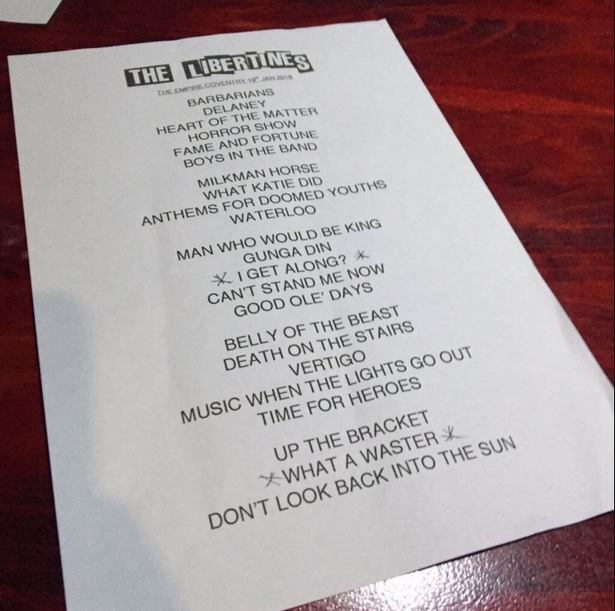 The crowd erupted and was left to sing the first two verses of the songs, putting a big smile upon all The Libertines' faces. There was only one song that can follow that and it has never seemed so relevant as before. 'Time for Heroes' and there they were, true heroes to so many of us. Rock and Roll isn't dead, it alive and well and it's called 'The Libertines', surely though that couldn't be the end of the night? After 10 minutes chanting and the whole of 'Twist and Shout' being sang by the crowd, the boys came back to the stage to preform 3 more classics 'Up The Bracket', 'What A Waster' and 'Don't Look Back Into The Sun' putting an end to one of the best gigs I've ever attended. Overall a fantastic night for everyone at the venue and especially for Coventry music scene. Is the stadium tour going to be the same or would it be as Pete said 'We're not coming back from that again', we'll just have to wait and see.